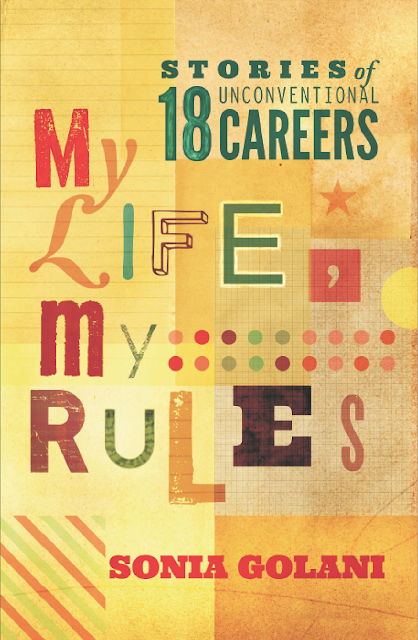 Title: My life, my rules. The cover page of the book is a bright yellow with a colourful topography. As the title suggests, the book contains the stories about eighteen people who decided to chose their passion as a full-time profession. The author has provided a disclaimer that the book does not tell you how to take up alternative career path or become become successful entrepreneurs. It is interesting to see the sketches of each person at the beginning to the story. Sonia has picked up few of the celebrities in her book and has interviewed them. Each story is about a successful entrepreneur and the hurdles they have faced to reach the top level. A story about Rahul Akerkar, a Biochemical Engineer and while pursuing his PhD in the USA decides to become a restauranteur. He realises that his passion was cooking and not PhD. What made his take such a step being an engineer? Was his family happy about his decision? What were the challenges he faced while setting up a restaurant. The other stories are about the famous people whom we see on the television and have admired them. Nikhil Chinappa, an architect turned VJ, RJ and a DJ. Most of us are always surprised to see him on MTV while he holds a professional degree from a reputed college. Likewise, Aditi Govitrikar, a doctor by profession who worked hard day and night to get a medical seat turns into a model and actor. Most of them would end up thinking, how can someone with a pretty face, who struggled so much would get into modelling. Being an MBA from the top B school, IIM-A, Harsha Bhogle turns into a commentator though his childhood dream was to become a cricketer. a Chemical engineer and an MBA from Narsee Monjee, now a Managing Director of Great Indian Outdoors Private Limited. an alumni of IIM Calcutta is a founder of Collage Sports Management. an Electronics Engineer turned actor. a PhD in Environmental Toxicology from a top US university turns into a Bass guitar player and Vocalist, band Indian Ocean. an alumni of IIT Bombay now the Chief Minister of Goa. Founder and CEO of Sula Vineyards. Legendary cricketer and Chairman of the National Selection Committee. ex-secretary general, CIVIVUS - World Alliance for Citizen Participation. Founder of Tarun Tahiliani Design Studio. Bestselling author of Shiva Trilogy. Managing Director, IITians PACE Education Private Limited. Food Critic, Author and TV Host. After completing the book, I felt that the author had chosen each celebrity carefully and spent a considerable amount of time on their childhood dreams, how their family influenced them, how their spouses were supportive and most important, if they ever regret over making such a major decision which has has a huge impact. I felt the book was written on the similar lines as Stay Hungry Stay Foolish by Rashmi Bansal. At some point of time, the author has given too much information which the reader would lose focus. About the author: Sonia Golani is an alumna of Lady Shri Ram College, Delhi and a Post Graduate from Delhi University. She has been managing her recruitment consulting firm Management Consultants Group since setting it up in 1998. MCG specialises in recruitment of professionals (MBAs and CAs) for Banking, Financial Services, Insurance and FMCG sectors.